Erotica 1 is the best isk doubler. #1 Erotica 1 stated in the EVE-O post that she thought the prices of a mining permit should be raised from 10mil for exhumers/Orcas. I don't believe this is necessary. Yes, 10mil is a pittance to anyone who mines for any length of time, but I believe James has stated before it's not about the money, it's about the acknowledgement of the New Order. Raising the price is going to make it look more like a money-making scheme. The ISK spent on a permit is symbolic of a miner accepting the tenants of the New Order. #2 This is more of a question than a comment. As mynnna reported on TMC, regarding the dev blog that high-sec ice belts are going away. How do you guys think is this going to affect groups like the New Order? You need only hit the on-board scanner to find an ice anomaly, similar to finding a training site in a newb system, or a sleeper garrison in a wormhole. No scan probe launcher required. So the scout alt will need to hit the on-board scanner once. Not a big deal. In fact, there is a new opportunity here, as Darth Nefarious pointed out to us in a panic: We can prevent new ice from spawning by bumping miners away from the last bit of ice in the anomaly. The new ice system will change the ganking game somewhat. Ice will appear every four hours, triggering a mini gold rush. Gankers can find the sites easily, as Trask says. Miners will compete to get onsite and mining as fast as possible, and they will mine until it is exhausted. CCP is estimating that exhaustion will happen in just 48 minutes. Thus the concentration of targets will be higher, but for less time. A gankfleet will only be able to get in 3-4 ganks per ganker in that time. 3-4 ganks per 4 hours and 48 minutes of ice mining. That's a lot less than the NO can do now! So this change is somewhat of a nerf for iceminer ganking; CCP has set up a system that naturally herds the miners into more larger flocks but for 1/5 of the time. Wolves still eat, but less. On the other hand, I do think the new system will be great for bumpers. Currently, the loss of income associated with getting bumped is not huge: you lose the time from the bump and slowboating back, and if AFK, you lose a full mining hold. But ice is not that valuable anyway: an hour of ice is still just a few million ISK. (Funny how much rage even this mild deprivation causes some people.) Now imagine that ice is five or ten times the price, and you mine 2x as fast, and all the ice is gone in 40 minutes. Spending any time not mining is much more costly to you than before. And you cannot afford to AFK at all, because if you do a single bump out of range cuts your ice income to zero. I don't think it will be practical to prevent spawning, because the last ice in the anom will have a lot of hungry miners vying for it. Interesting analysis, Von Keigai. It seems that concentrating more miners in a single location would be a double-edged sword for the ganker. On the one hand, target selection is easier. On the other hand, CONCORD / vulture squads can protect more targets on the same grid. @estria del: "I don't believe this is necessary. Yes, 10mil is a pittance to anyone who mines for any length of time, but I believe James has stated before it's not about the money, it's about the acknowledgement of the New Order. " This is an accurate summation of the situation for the last year, yes. After Odyssey, things may change. It's a bit early to make changes now, before seeing how demand/supply/size of hisec ice anomalies/price after Odyssey will all work out; but to simply say that changes won't be necessary, given how much of the above is still unknown, is a rather massive claim on your part that would require hundreds of pages of proofs to be considered as a serious effort. Since no one wants to read those hundreds of pages covering every possible scenario, let's just wait and see what Odyssey will bring. If the new economic reality makes charging hundreds of millions of ISK for a permit a viable economic strategy, and the New Order doesn't do that, then someone else will, effectively rendering the NO superfluous. In that case, of course the NO should adapt to the new circumstances. About time you plundered the assets and left isn't it? As long as people who want to keep making EvE dark and dangerous keep throwing ISK at him, he will continue to organize more Orca massacres. Why should he even bother to take the ISK and run? What he is doing now is absolutely hilarious. I'm pretty sure James prefers scores of dead Orcas over ISK (which he has plenty of left over from the days of Currin Trading) any day. I smell a rat or scammer here. Could Erotica 1 be controlled by one scammer James 315??? If they are not connected the the logical thing to do is to invest all the 12bn isk with Erotica 1 to turn it into 24bn. Then to 48bn. No? Why do you need additional proof? The word of the Supreme Protector is proof enough. For quite some time, people have accused me of being an alt of James 315, the Mittani, etc. For awhile, my thought was always that it is such blasphemy to think such things. But I have come to realize that due to the awesome powers, intellect, multitasking abilities, etc that these individuals exhibit, it is clear to me now that it is perfectly reasonable for people to come to this conclusion. 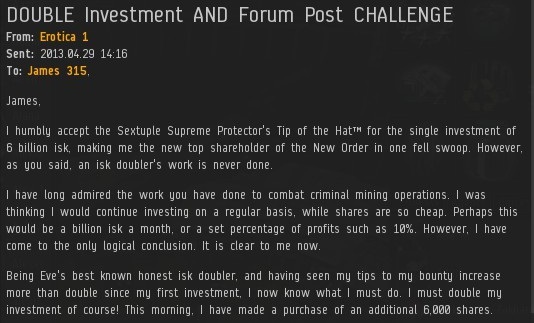 After all, if anyone in Eve could possibly be dealing with belligerent code breakers in and ice belt, and at the same time be doubling isk in a trade hub, it could only be but one.... The all powerful Saviour of High Sec himself, James 315. But then I compare his way with words to my own, and sadly I cannot compare. It then dawns on me that I cannot possible be James 315. I have to hand it to Erotica, she's one of the smartest and most dedicated scammers out there and this kind of marketing scheme is genius. Hell I almost want to wish her good luck in her scamming for the effort alone.